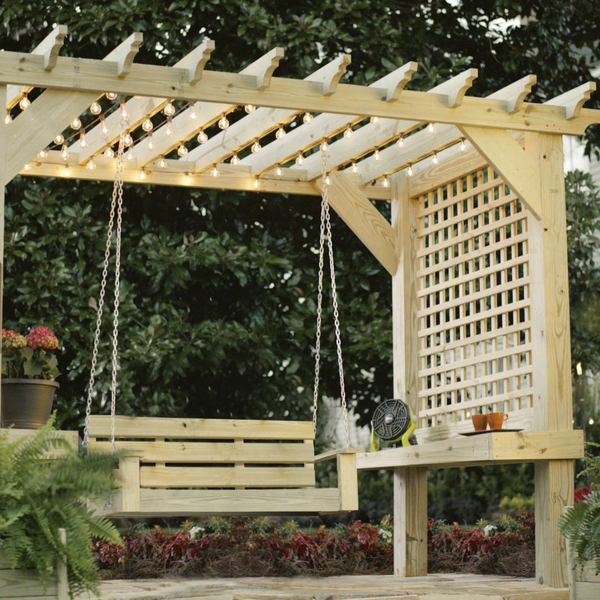 This pergola has it all - built in shelves and modern lattice for shade on sides. 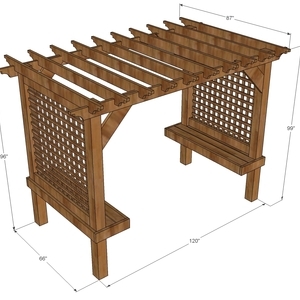 It’s easy to build, and you can make it your own by cutting decorative patterns in the rafter tails. Carefully space 6x6 posts out on a level surface, 120” apart from outside to outside. Mark 141” long rafters, 10-1/2” in from ends on each end. 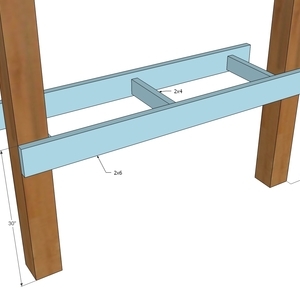 Predrill four holes and attach two posts with 3-1/2” long exterior decking screws. 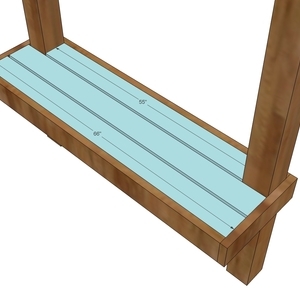 Make sure the two posts are parallel at top and bottom when you attach rafters. 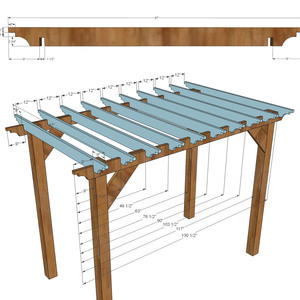 NOTE: If cutting decorative tails on rafters (see step 3) do this on sawhorses on the ground before attaching to pergola. 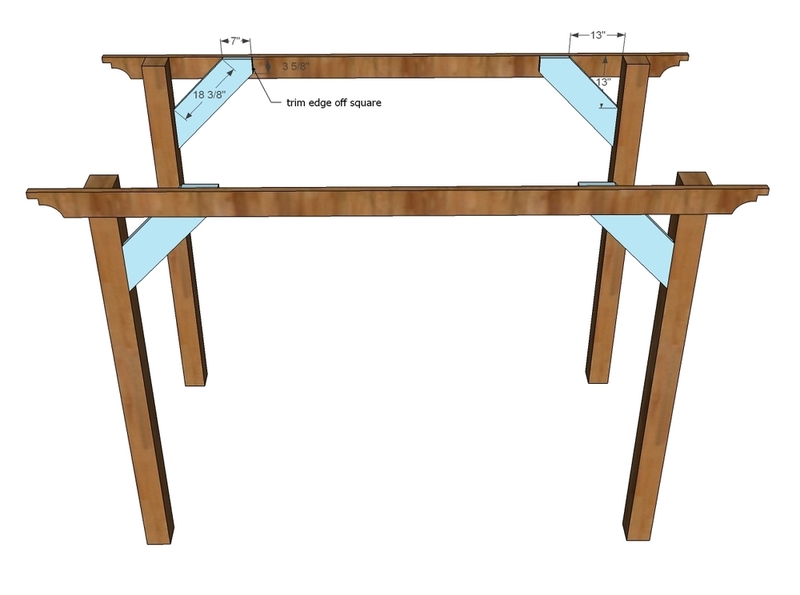 **Exclusive Feature**: Click here to download Ana's blueprints for this How-To! Check to make sure your posts are parallel to each other. 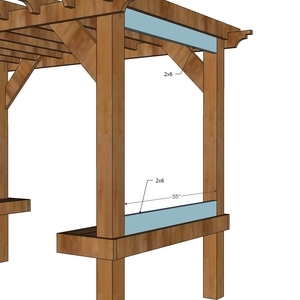 Then attach cross supports to posts and rafters. To attach to rafters, use 2-1/2” exterior deck screws. 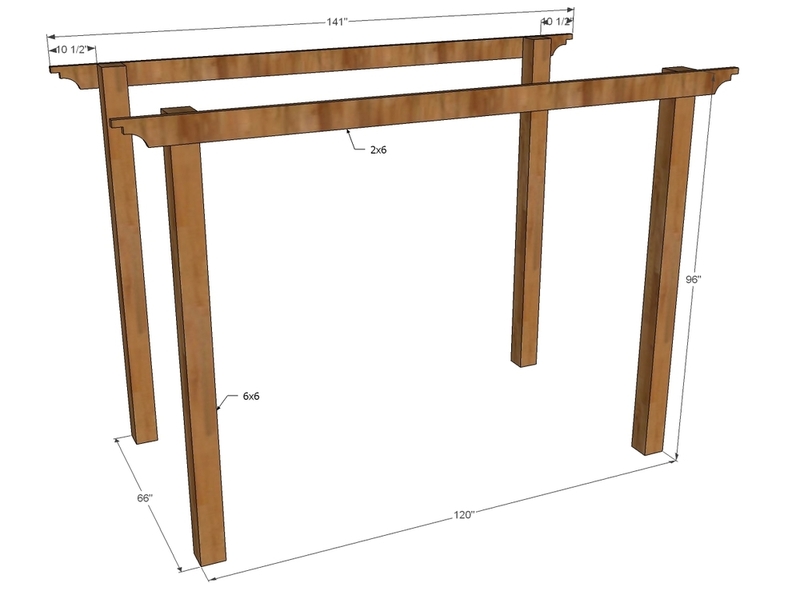 To attach to posts, either drill 1-1/2” pocket holes and use 2-1/2” pocket hole screws, or attach using metal brackets. 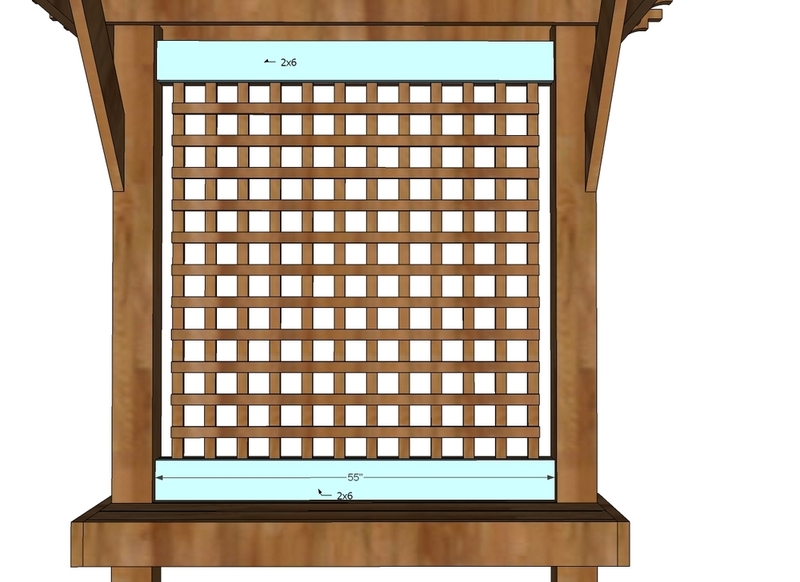 Cut tails of rafters if desired I decorative pattern with jigsaw. 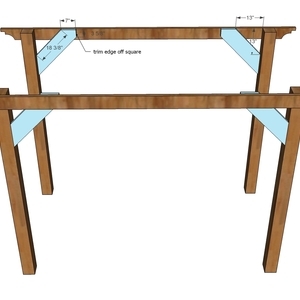 Notch out rafters by setting saw blade depth of circular saw to 2-3/4”, and make cuts every 1/4” in the wood to be removed. Use a chisel to remove wood. TIP: Notch multiple rafters at the same time by clamping together and cutting. Mark rafters attached to top of posts for upper layer of rafters. 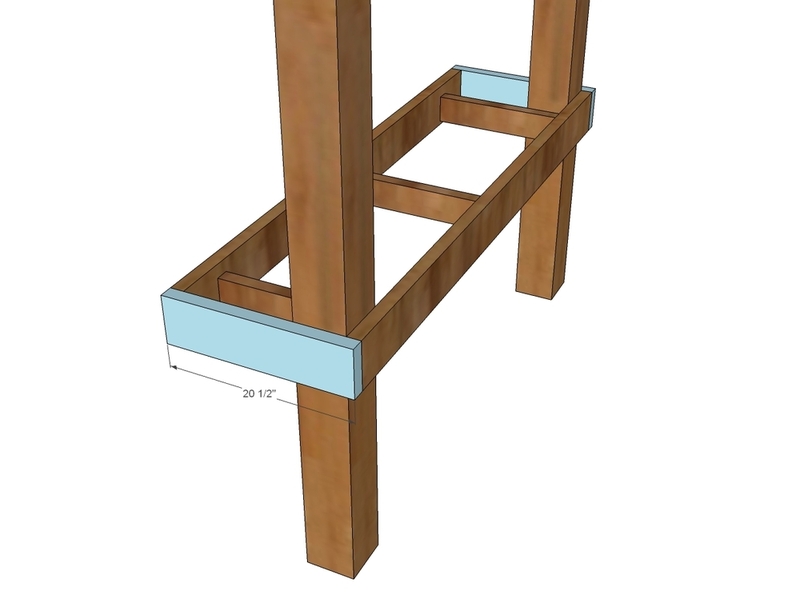 Attach upper rafters to lower rafters with 3-1/2” screws through top. 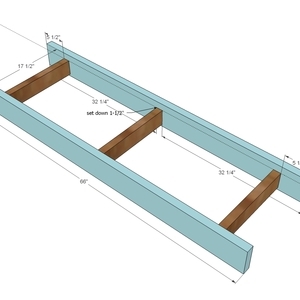 TIP: Cut a 12” scrap wood piece and use it as a spacer when attaching rafters. 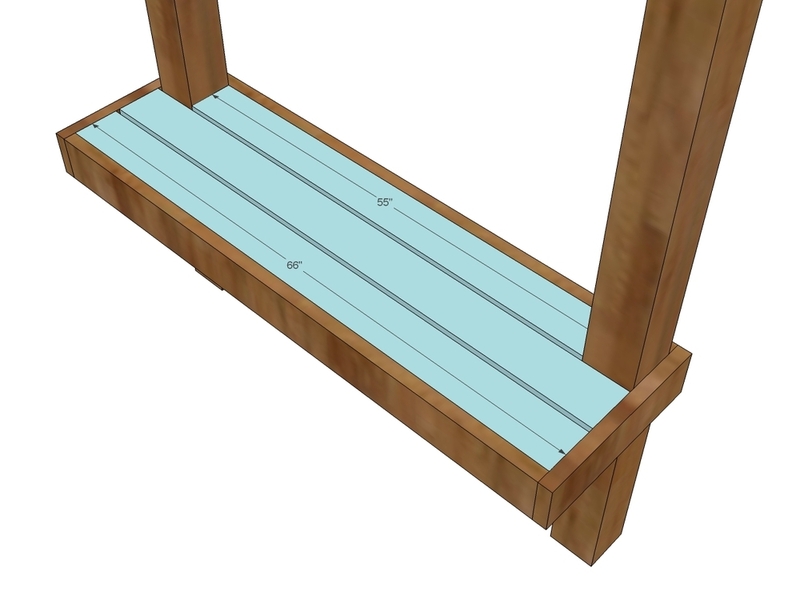 Begin building shelves by attaching 17-1/2” 2x4s to 66” 2x6s with 2-1/2” exterior deck screws, predrilling holes, with 2 screws per joint. 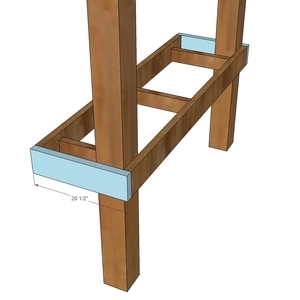 Use 3-1/2” exterior deck screws to attach shelves to posts. Predrill holes and attach through both 2x4s and 2x6s. 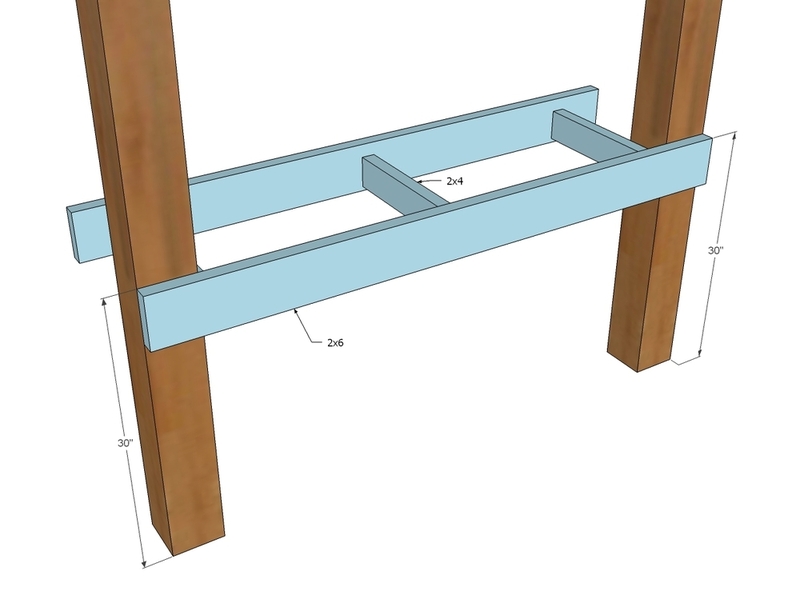 Predrill holes and attach 20-1/2” long 2x6 to ends of shelf 2x6 boards with 2-1/2” exterior wood screws. Lay seat boards in place. 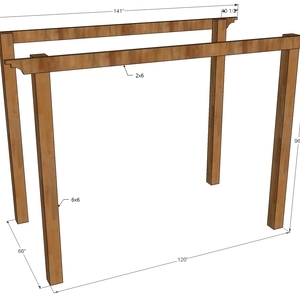 Attach to 2x4 framing with 2-1/2” exterior deck screws through predrilled holes. Drill (2) 1-1/2” pocket holes on each end of 2x6 boards that are 55” long. Attach to posts with 2-1/2” pocket hole screws. Use 2” staplers to attach vertical lattice boards to 2x6s from previous step. Start 1-1/2” offset from center and work outward. 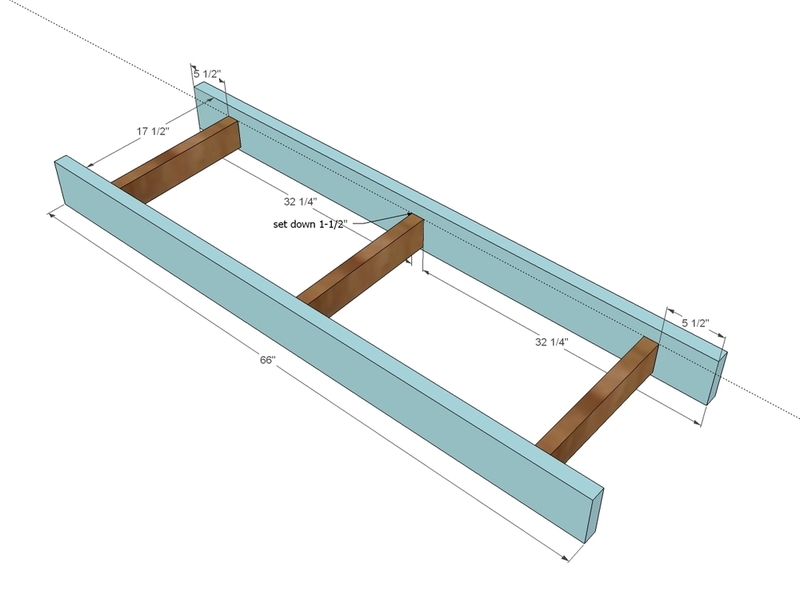 TIP: Use (2) 3” wood scrap blocks as spacers. 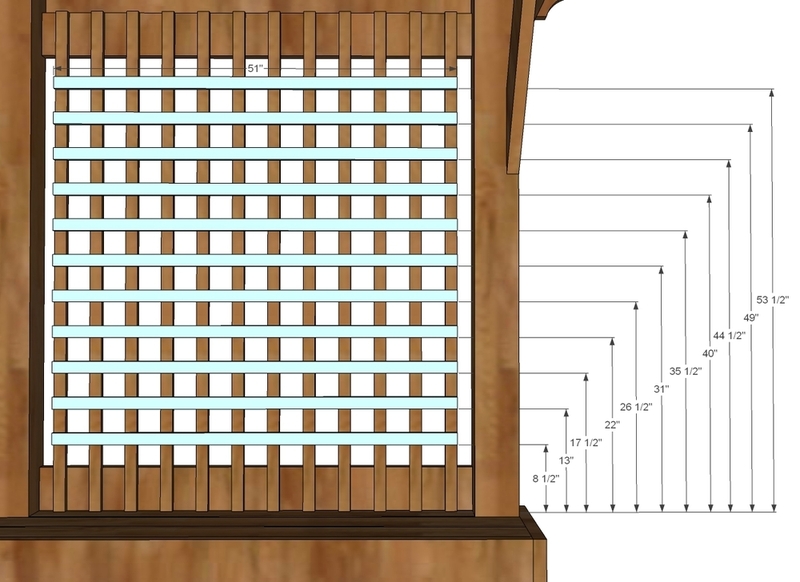 Attach horizontal lattice boards to the vertical lattice boards with 1-1/4” staples. Spacing between boards is 3”. 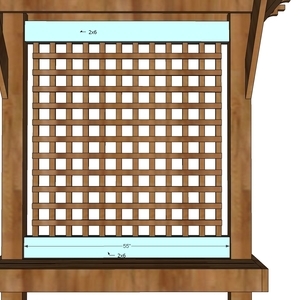 Trim inside edges of lattice with 2x6 boards. Attach to posts with 1-1/2” pocket holes and 2-1/2” pocket hole screws. 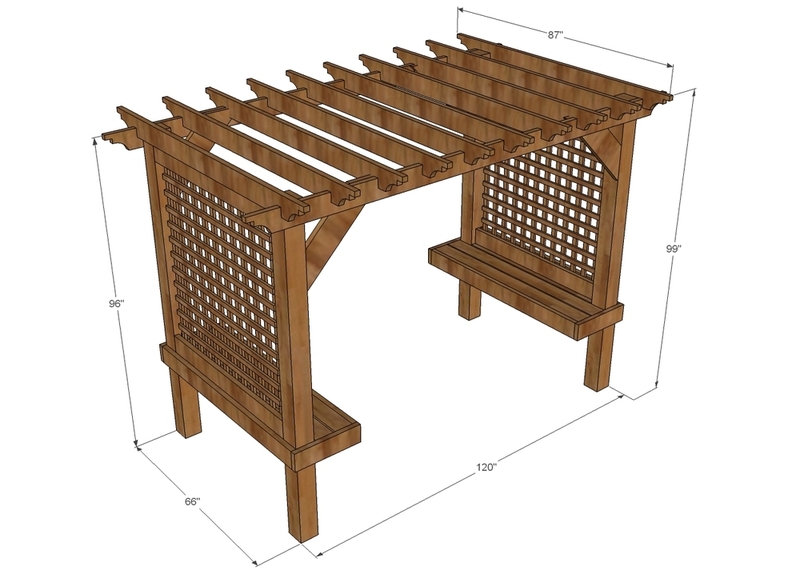 Here is the entire rendering of the pergola's dimensions. 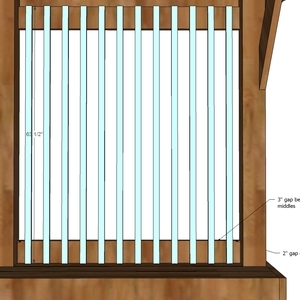 Would love to build this, if only I had the space for it. Am I right that this probably still needs to be anchored into the ground if you live in a very windy area? Or maybe anchored to the house is enough? 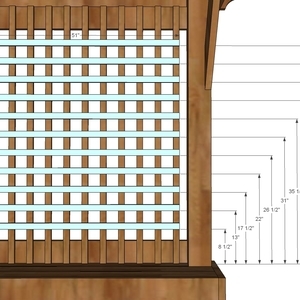 Where can I get the 24 - 1x2x10 boards? All the stores I've talked to only sell in 8ft length. It's a lot of waste and extra money to cut the 8 footers down! 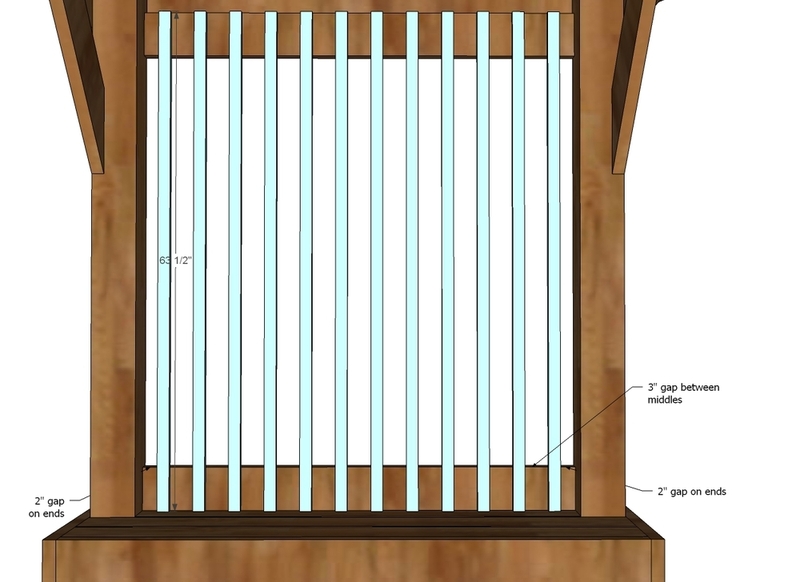 It's very nice project to do for my home. 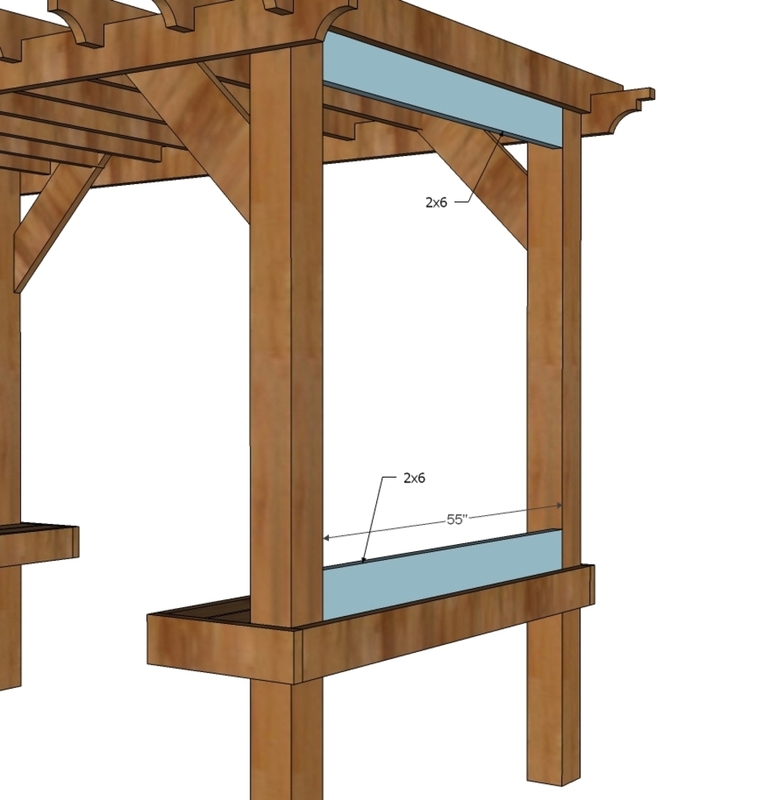 I want to build a patio cover 26wx12dx9h attached to the house. This is great; but why are there no instructions for attaching the swing? That's sort of the part I need to know about in terms of support, torque on the frame Etc. You are blessed with amazing talent Ana, thanks for sharing designs with us. Can I use 4x4 posts instead of 6x6? What kind of wood do you recommend using? Is it pine? Or is it cedar?